The gold supply and demand dynamic is currently in balance. With increasing demand and declining gold prices causing cut backs at gold miners and reduced scrap supply, how long until the gold supply demand dynamic goes into deficit? According to Overall Metal Focus global gold supply will be be down 2% at 139 million ounces (4,323 tonnes) for the full year, with supply and demand in balance. Gold supply and demand is in surplus with mining production and scrap keeping up with demand. Yesterday the World Gold Council issued their third quarter 2014 gold supply and demand report that showed a 2% decrease in demand year over year and a 7% drop in supply with the volume of recycled gold continuing to shrink. Increased gold mining costs now exceed the price of gold and may soon threaten supply. The most important trend in gold demand in recent years is the shift from west to east. In ““Gold Around The World”” we noted the insatiable gold demand of China, Russia and India. In “The Importance of Gold To Nations and Individuals” we noted, in contrast, that gold is of little interest to the vast majority of U.S. citizens, the U.S. government or the Federal Reserve. They should have added that strong gold demand from Russia, India, the rest of Asia and perhaps from Switerland, if the Save Our Swiss Gold initiative passes on November 30, which would require the Swiss National Bank to purchase approximately 1,500 tons of gold to boost its gold reserves to 20% in accordance with the initiative, would also act as a floor on the price of gold. Russia and China are recent entrants in the top gold holding nations. Switzerland, having sold 1500 tons of gold in the 2000’s, has fallen out of the top five. Gold demand is coming increasingly from eastern nations, and less from the United States and Western Europe. About 70% of 2014 gold demand came from Asian nations. Demand for gold is increasing in the east, while decreasing in the west. As a result of increased gold buying in recent years, the east is gaining a larger percentage of the world’s gold. China is the number one consumer of gold in the world, passing India over the past two years during time which the Indian government has placed import duties on gold. Indeed China has been importing, producing and hoarding gold. Some speculate that China is accumulating gold to back its currency with gold. Bullionstar recently reported that Song Xin, President of the China Gold Association, General Manager of the China National Gold Group Corporation and Party Secretary China advocates that his country should accumulate 8,500 tonnes in official gold reserves. This would be more more gold than the official holdings of the United States. The volume of gold withdrawals at the Shanghai Gold Exchange is often larger than the world’s mining supply. Russia has been accumulating gold at a feverish pace as part of its de-dollarization efforts to reduce its reliance on the U.S. Dollar. Russia has been buying gold in increasing amounts during 2014. Russia made its largest gold purchase in more than a decade in September. Later this month, we will learn (and report here) whether Russia continued its gold buying spree in October. Russia added 1.2 million ounces of gold to its growing gold reserves in September 2014. Gold has acted as a hedge against a falling Russian Rouble. India is the second largest consumer of gold in the world behind China. It is estimated that Indian households own about a $950 billion in gold! Indeed, India has a national festival, Diwali, during which Indians buy gold in the form of coins, bars, jewelry and other adornments. Last year China surpassed India as the world’s largest consumer of gold. The relegation of India to second place doesn’t reflect a lack of demand for gold in India, but rather the imposition of heavy import duties placed on Indian gold imports the past few years. Imports of gold to India from Switzerland , however, doubled in September to 58 tons up from 27 tons in January. Scotia Mocatta recently reported that Indian gold imports (India has no meaningful domestic mining supply) are returning to normal elevated levels. Indeed, in the third quarter of 2014, Indians bought 182.9 tons of gold or nearly 35% of the global gold purchased for jewelry. In “The Importance of Gold to Individuals and Nations” we noted that the U.S. government, Federal Reserve and its citizens are generally not interested in gold. This chart of American Gold Eagle sales illustrates the tepid demand in the United States for physical gold. There is no reliable data, but a good portion of American Gold Eagles may have been sold to non U.S. citizens, making the U.S. gold consumption even lower. Sales of American Gold Eagle coins at the U.S. Mint have declined since 2008. In the U.S., gold is wrongly viewed as an investment instead of a wealth preserving asset. Gold has been marketed as a tradeable investment in the United States via ETFs. As the price of gold has declined, so have holdings in gold ETFs. Many Americans who chose to hold their gold in paper ETF form, rather than in allocated/insured vaulted physical bullion have sold their gold “holdings”. 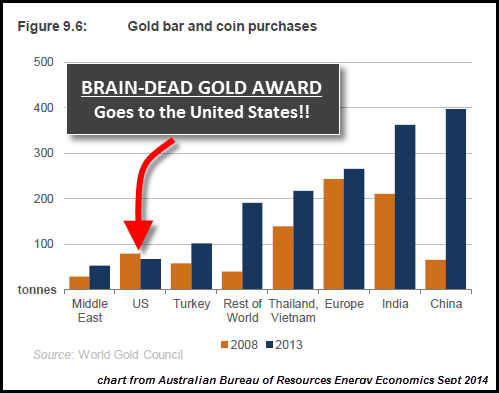 While Australia is a major producer of gold, Australians, in general, don’t consume much gold. The Perth Mint, recently reported slowing gold sales, which, according to the Perth Mint, represents declining global demand. The Perth Mint also notes that 90% of their output is exported highlighting that Australians are not large consumers of even their own domestic gold products. Despite all the attention on central banks’ gold holdings and discussions of gold as a monetary metal, hedge against inflation and insurance against financial/fiat currency collapses, according to the CPM Group jewerly is the number one use for gold this year. Jewelry is the largest component of gold demand this year. Jewelry is perenially the number one use for gold. In the third quarter of 2014, 534 tons of gold were used in the making of jewerly. Growing middle classes in populous India and China are producing a greater number of gold buying customers. Gold coins, medallions and bullion constitute about 15-20% of the annual gold demand. In the United States it was illegal to own gold from 1933-1975. As such, the United States did not produce gold coins during that period. Pursuant to Roosevelt’s Executive Order 6102 U.S. citizens were required to turn in their gold to the U.S. Government. The United States and other countries’ mints began to produce gold coins for individual collectors in the mid 1980’s. Among the best selling gold coins are the American Gold Eagle, the Canadian Gold Maple Leaf, the Austrian Gold Philharmonic, the Chinese Gold Panda, the South African Kruggerand and the Perth Mint gold coins. Prior to the mid 1980’s, the South African Mint was the primary producer of gold coins. Gold Exchange Traded Funds (ETF’s) are a relatively new product in the gold market. ETF’s allow investors to purchase shares that represent a propotional share of the value of gold held by the fund, but usually do not allow physical delivery of the gold. Gold ETFs became a popular mechanism for investing in gold during the price run up from 2005-2011 and their holdings grew. As the price of gold has declined, ETF gold holdings have also declined. Holdings in gold ETFs have dropped by 38 percent since they reached a record in December 2012. Gold ETF holdings peaked with the gold price around 2011. And the question is, why do central banks put money into an asset which has no rate of return, but cost of storage and insurance and everything else like that, why are they doing that? If you look at the data with a very few exceptions, all of the developed countries have gold reserves. Why? Intrinsic currencies like gold and silver, for example, are acceptable about a third party guarantee. Gold is a currency. It is still by all evidences the premier currency where no fiat currency, including the dollar, can match it. Net purchases of gold by central banks were 544 tons in 2012, 409 tons in 2013 and 334 tons through the third quarter of 2014. Russia and China have been boosting their gold production in recent years. See also Gold Investing News’ slightly different top 2013 gold producing nations list. Countries in the east are not only consuming more gold they are also producing more gold. Despite the recent fall in the price of gold, output is still rising and sales of mining equipment growing. Despite the seemingly healthy mining production output, declining gold prices are causing trouble for miners. Reuters recently reported that gold firms plan drastic cuts to stay afloat as the price of gold sinks. Typical of the cost reductions that gold miners are undergoing was the announcement by Iamgold in mid November that it was cutting its executive team by 40%. Iamgold also reported that in addition to the $125 million in cost reductions from last year that it would seek to further reduce its general and administrative costs by 10% in 2015 as well as undergo cost reductions at its various mines. Further clouding the gold supply picture is the continued decline in scrap gold and the rise of China and Russia as major producers and consumers of gold. China is the world’s number one gold producer but exports little or none of its production. China is also the world’s largest importer and consumer of gold. China has doubled its gold production since 2000 to become the world’s largest producer. China has increased its gold production every year since 1999. China has become the largest gold importer and producer in the world. Russia has stepped up its gold purchases and it production of gold. Russia passed the United States last year to become the world’s third largest gold producer in the world. Due to international sanctions, Russia may be forced to consume an increasing amount of its own gold production, putting a strain on global gold supply. Unlike silver, where most silver is consumed and never recovered, nearly all gold ever mined is still available in some form. Hence, new gold supply is less important in the supply demand analysis than silver where much of the demand must be met by current mining supply. Gold demand, in contrast, can be met in part by existing above ground stocks of gold, or scrap. It has been estimated that annual gold mining production adds only 1.5% to the global gold supply. Gold scrap, however, as a percentage of supply has been decreasing in recent years. Increased demand, therefore has to be met by increased mining supply, which is threatened by a declining gold price. If mining production declines in 2015 and demand remains constant or increases, a supply/demand deficit may form. In general, when demand exceeds supply, prices rise. As we have seen, however, in the silver market, a supply/demand deficit does not always lead to higher prices. All charts were produced for Smaulgld courtesy of Nick Laird of Sharelynx – The Gold Standard in Precious Metals Charts, except the Shanghai Gold Exchange Monthly Deliveries vs. Mining Supply 2009-2014 chart which is reprinted with the permission of Koos Janson of In Gold We Trust. A special thanks to Nick as he helped collate the data for the various charts and applied his prodigious charting skills to produce them.